"It is a refocusing to do our mitzvahs with KAVANAH--putting the "soul" in our mitzvahs... living them,"
says Rabbi Yaakov Zalman Labinsky MSW of BecomingDivine.com. Mindful Mitzvahs Campaign had its kick-off in the Baltimore community, thanks to the ongoing enthusiasm and dedication of Frank & Danielle Sarah Storch*. 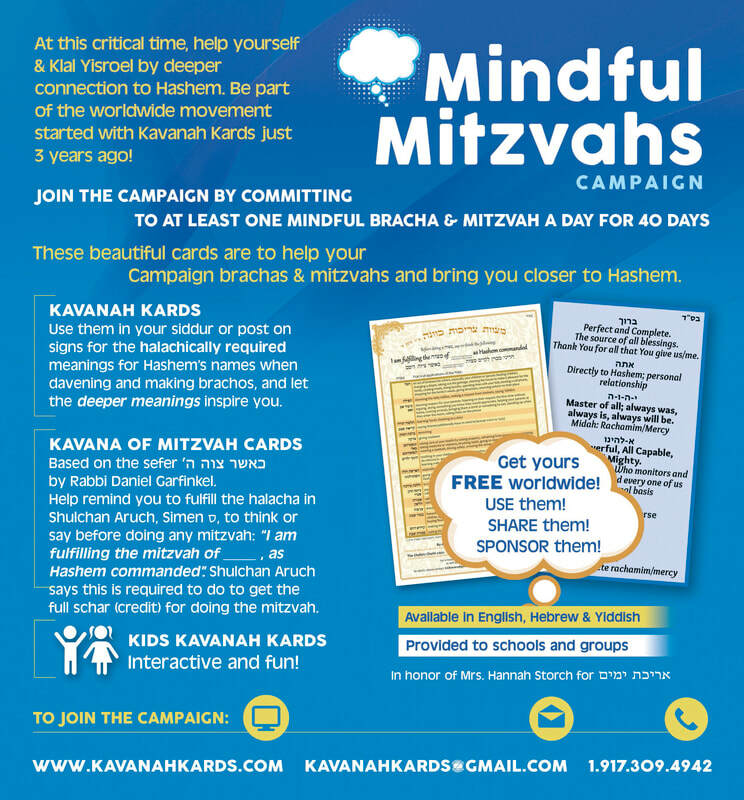 B"H brought the Mindful Mitzvahs Campaign worldwide. More than 300 people visited the website that week and thousands of Kavanah Kards and Mindful Mitzvahs pamphlets were sent to the US, Canada and England in just the first two weeks! The momentum continues full force, B"H, with an update and notice in Mishpacha Magazine before Rosh Hashana that generates requests from individuals, teachers and schools far and wide. a new generation that grows with proper kavanah from the start! will help this dream become reality! The more people who participate, the greater the brachos for Klal Yisroel, BE"H.
to do more yourself and get others to do it as well.